ASIC Prototyping refers to application-specific integrated circuit. The system architecture is based on a modular and scalable system concept. 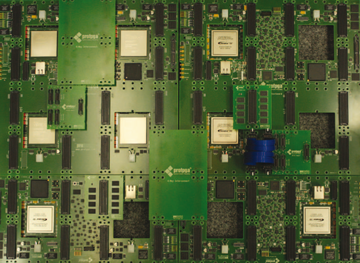 The FPGAs are assembled on dedicated FPGA modules, which will be plugged on the proFPGA uno, duo or quad motherboard. This offers the highest flexibility on the market. For example you can use different FPGA types in one system or scale your system in increments of one FPGA. The user has nearly 100% access to all available I/Os of the FPGA, which gives him maximum freedom regarding the FPGA interconnection structure. This way the prototyping system can be adapted in the best way to any user design. 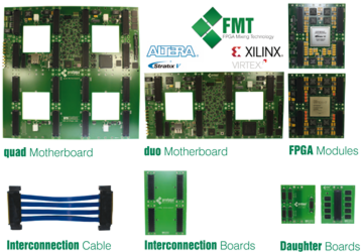 Furthermore the system offers a total of up to 40 extension sites on the top and bottom site of each quad motherboard for standard or user specific extension boards like DDR4 memory, PCIe gen1/2/3, Gigabit Ethernet, USB 3.0 or other high performance interface and interconnection boards. The system can be scaled horizontally and vertically, by connecting boards side by side or stacking several boards on top of each other. We offer a great variety of FPGA Prototyping Products. Equipped with up to 4 Xilinx Virtex® UltraScale™ 440 FPGA modules, the proFPGA quad system can handle up to 120 M ASIC gates on only one board. Due to the fact, that multiple proFPGA quad or duo systems (up to 5) can be connected to an even larger system, there is a maximum capacity of 600 M ASIC gates. The modular concept allows an easy expansion of the system capacity by adding additional FPGA modules. Besides, users can create project specific prototypes in the quickest and easiest way. Inter- face, memory, or customer specific application boards can simply be plugged as daughter cards on the extension sites of the proFPGA system. The open system architecture makes nearly all FPGA I/Os available to the user and enables highest interconnection flexibility between all FPGAs and extension sites. It assists in adjusting the connection architecture to the design in the best possible way.